"An instant classic British spy novel - mature, thoughtful, and intelligent." When the Cold War ended, Jack Case was one spy too many. Cut adrift and superfluous in a changing world, he was discarded by British Intelligence. Then, after 9/11, rapid recruitment brought in a rash of new, talented young men and women. They were trained and put into the field swiftly - often too swiftly. And then the mistakes started to happen. Mistakes that should have been avoided. Mistakes that could be embarrassing to Her Majesty's Government. Thus, Jack was brought back into the intelligence fold, heading up a new team of "Scavengers" - experienced agents who could be sent to clear up the messes left behind by newer recruits before evidence incriminating MI5 and MI6 could be discovered. Jack is sent to tidy up one last case. In a quiet Alaskan backwater, a man named Danny Lewin has committed suicide with a handgun. But this was no ordinary suicide. This was an agent who held secrets. A man haunted by his past interrogating prisoners in Iraq. And British Intelligence fear that he put his secrets down on paper. For Jack, his mission is straightforward. He must travel to Alaska and retrieve Lewin's journal before someone else can lay their hands on it. Before long, Jack realises that there are individuals just as skilled and determined as himself searching for the journal - individuals who are willing to kill in order to get what they want. Case is drawn into a manhunt that drags him into the murky underworld of contemporary espionage and leaves him questioning who his allies and who is enemies are. The rules of the game have changed since the days of the Cold War. Now Case must impose his own rules. Scavenger rules. 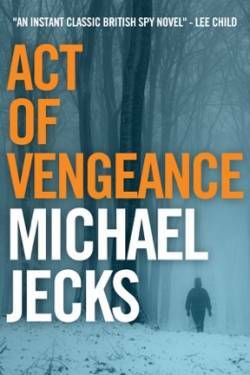 Michael Jecks talked about Act of Vengeance in his Christmas 2012 Newsletter. and from Amazon.com, also for Kindle or in paperback.